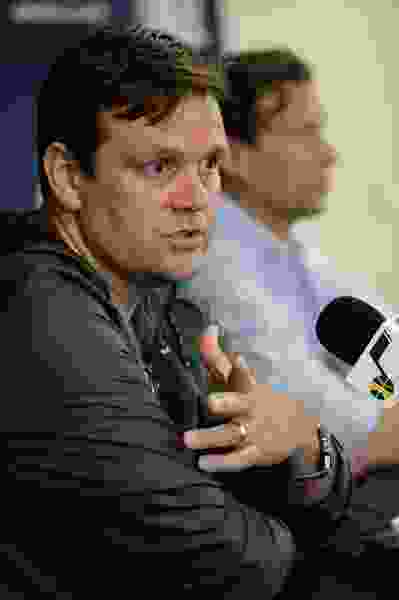 (Francisco Kjolseth | The Salt Lake Tribune) Utah Jazz General Manager Dennis Lindsey and head coach Quin Snyder speak with the media during exit interviews at their practice facility in Salt Lake City Wed., May 8, 2018, after losing to the Houston Rockets in game 5 of their Western Conference Finals during the 2018 NBA Playoffs. As the world waits to hear where LeBron James will be taking his talents, free agency in Utah is likely to be a good deal less buzzy. The Jazz, it is widely understood, are looking to lock up the players they had last season, including Derrick Favors, Dante Exum, Raul Neto and Georges Niang. It’s not a strategy that appeals to the imagination that so often accompanies free agency — then again, that has never really been Dennis Lindsey’s style. That might be less than satisfying to some fans, who see players such as James and Paul George on the market and would love to take a shot, however short the odds of landing either of them this summer. But there is a summer coming in which the Jazz could be well-positioned to swing away at free agency: 2019. And that’s taken a few summers of carefully managed flexibility that becomes more apparent beneath of the surface of Utah’s mundane facade. The Jazz expect to be above the salary cap this summer, but below the luxury tax — a reasonable place for the No. 5 seed in the West to be. Collective Bargaining Agreement rules dictate that NBA teams need cap holds, or dollar estimations that count against the salary cap, for its free agents. To sign a big name free agent, the Jazz would need to renounce the rights to all their free agents and decline all team options on Thabo Sefolosha, Jonas Jerebko and Ekpe Udoh, amounting to a gutting of their roster and still not putting them in the ballpark of the cap space the Los Angeles Lakers (up to more than $60 million) can offer, for example. At most this season, various media estimates are the Jazz could get $20 million under the cap. But 2019 will be different: That’s when Ricky Rubio and Alec Burks, who are expected to make a combined $26.5 million next season, become free agents. If the Jazz exercise options on Sefolosha, Jerebko and Udoh, their combined $12.8 million would come off the books in 2019. If the Jazz and Favors make a one-year deal this summer — which The Salt Lake Tribune has reported is a possibility — his salary space could also be freed up. For now, 2019 is being called the summer of Klay Thompson: The Warriors’ sharpshooter is probably the biggest name scheduled to become an unrestricted free agent, and while it’s unclear if he wants to leave Golden State, he’ll have a considerable market. But there’s also less heralded free agents, such as Tobias Harris or Kemba Walker, who could be up for bidding. There may also be players who are attainable in restricted free agency: A number of 2015 Draft picks haven’t lived up to potential but may be worth taking a flier on, such as Justise Winslow or Stanley Johnson. There’s also an increasing trend that players are themselves doing shorter deals, such as Kevin Durant’s sequence of deals with the Warriors, which means someone big could be available in 2019 that wasn’t expected. There are a lot of questions that remain for next summer, such as if the Jazz want to bring back Rubio, who has blended well into the team. If Favors and Exum get signed to long-term deals this summer, that tightens salary cap space, but also limit the role of free agents. There is some risk to those choices as well: Was the 29-6 run to end the season a bit of a fluke, or something which the franchise can build a long-term vision around? The Jazz won’t know the answer to that question without giving the core of the 2017-18 team another shot to prove it again. But the Jazz have shown considerable foresight and restraint in allowing themselves to have the flexibility to make those decisions next summer. One could point to the summer of 2016, when money flew around to players such as Miami’s Tyler Johnson and Portland’s Evan Turner — contracts that are now giving headaches to the teams that drew them up. The Jazz largely removed themselves from the equation that year, holding back as other franchises made splashy signings with elaborate press conferences. Now, the Jazz are in better financial position than both Miami and Portland, among other fringe playoff teams, which have largely topped out on talent. Since the salary cap jumped less this season than previous years, agents have had to stress to players to lower their salary expectations, which is more advantageous for teams like the Jazz. Utah is likely to be holding steady this summer, relying on continuity and internal development to keep them competitive as other teams look elsewhere for answers. But with foundational pieces in place, including Rudy Gobert and Donovan Mitchell, and a good deal of flexibility for next summer, the Jazz are keeping their eyes ahead instead of simply keeping up with the Joneses. It’s not the most exciting style, but it appears to be, so far, a sustainable one. In its debut season, the Ute lacrosse team has developed a humble star. Utah native Josh Stout is one of the country’s top 20 goal-scorers.